-Place berries, Coffee-mate and milk in food processor; cover. Pulse until smooth. Serve immediately or spoon into a freezer safe container, cover and freeze for later enjoyment. I bought a bag of frozen strawberries and a bag of mixed berries that had blueberries, raspberries and blackberries. Just mixed all the ingredients and blended them together with my Ninja. It was ready to eat immediately and I dug right in 🙂 I can’t resist any frozen treats. It is very delicious, you can taste the hint of vanilla from the Coffee-mate Natural Bliss Vanilla and its very light, fruity and refreshing. I also had leftovers that I stored in the freezer. It makes about 6 good size servings. Not only is it delicious but it’s a perfect recipe for busy mom’s because it only takes a few minutes to whip together! -Place mango, coconut milk, Coffee-mate, sugar, lime juice and sea salt in food processor container; cover. Process until smooth. Transfer to a container and refrigerate for at least 1 hour. -Spoon mixture into ice cream maker and freeze according to manufacturer’s directions. Serve immediately in waffle cones or transfer mixture to covered container and freeze to enjoy later. I highly recommend trying these recipes out this summer! They are quick, easy and delicious and we’re a big hit with my family. 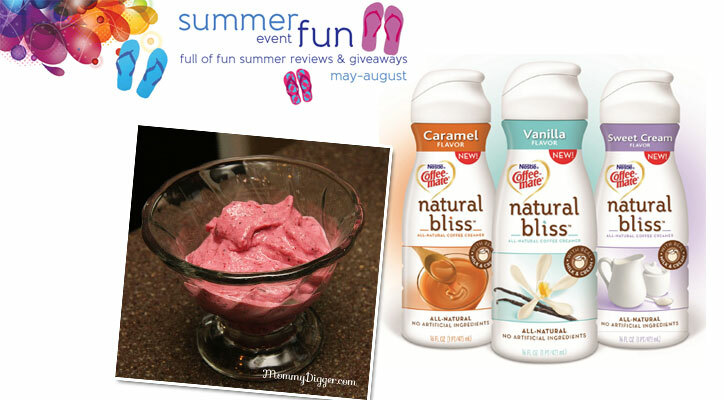 Coffee-mate is giving one lucky winner 4 coupons for free bottles of Coffee-mate Natural Bliss! To enter fill out the Rafflecopter form below. Ends 7/16 at 11:59PM EST. Visit Coffee-mate and leave a comment telling me which recipe you’d love to try most! I would love to try the Mango Bliss smoothie , yum! Simple Tiramisu is my recipe of choice! I would like to try the Eggnog Tiramisu recipe. wow – never would have thought of this!